We just got back from our last wedding of the summer! Such a great summer full of weddings, friends and family. One of my best friends from childhood got married Saturday and it was a full blown western extravaganza. They arrived in an old fashioned stagecoach pulled by horses and her dress was all lace and pearls... just beautiful. We got to see a lot of friends that we hadn't seen in a long time (some of whom were quite surprised to see my 38 week pregnant belly) and had a great time visiting. Plus, we got to spend some time with the family which is always good. We got home yesterday and Brad and I spent the evening being lazy. We rented a movie and I did a little scrapbooking. It was great. And, I will continue to work towards that future. 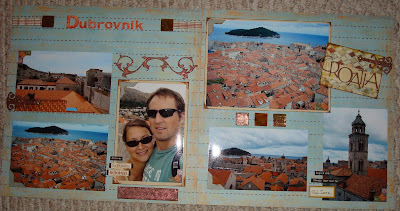 Here is another two page layout of our time in Dubrovnik. Plus, a close up of the grunge board I used throughout the layout (the hinge shown here, as well as another hinge, a swirl, and a solid bar used throughout the two page layout) and the new glimmer mist colour I got (the coppery brown I used on the hinge). Fun stuff. Also, if anyone wants tickets to the AC/DC concert this Wednesday in Edmonton, let me know. My cousin has two floor tickets to sell.